In an interview in Ecuavisa’s news program, Contacto Directo, PRIAN List 7 candidate for President of the Republic, Álvaro Noboa, stated that if during his government he would not have a majority in the Assembly in order to make viable his plan for government and institute Constitutional reforms, he would call on the Ecuadorian people. He insisted that his system of government is going to be on the left in regards to social issues, while of free trade and free commerce in regards to economic issues. That he would lower income taxes to 10%, and would attract foreign investment. He would prioritize attention to farmers and the unemployed, lowering the cost of agricultural supplies, applying more equitable commercialization, and he did not discard an amnesty for the debts of farmers to the Banco Nacional de Fomento (National Development Bank) He would fight unemployment by attracting a thousand large companies with tax incentives and judicial guarantees. He repeated that we live under a dictatorship in which the President of the Republic controlled the other powers of State and that uses them to gain an advantage in the electoral campaign. Noboa offered the example of how the Internal Revenue Service (IRS) had politically persecuted him with the invention of an audit and an inexistent debt and had prohibited his recourse to a measure of defense via the justice system, which he had already denounced to the Organization of American States (OAS). Álvaro Noboa insisted that he would dedicate great attention to the issue of crime and that he would not discard the possibility of bringing world experts, like the former mayor of New York, Rudolph Giuliani, who brought an end to crime in that city. Alfredo Pinoargote: We continue today with the Presidential proposals with Alvaro Noboa, PRIAN candidate for President of the Republic. The questions will be answered within one minute each, and at the end a message of one minute for each citizen. The sound of the clock will indicate that the time is up 15 seconds before the end. Good morning. Welcome to Contacto Directo. Álvaro Noboa: Thank you very much. Alfredo Pinoargote: In the Presidential regimen, the President of the Republic is also Chief of State and has the obligation to maintain a democratic system, basically via the respect for a separation of the independence of powers of State. Do you think that, currently, the republican institutions are weakened in regards to Presidential power? Do you believe that this certifies better government, or do you believe that it is necessary to restore the full rule of law? Álvaro Noboa: We are living in a dictatorship in which the Chief of State, in one way or another, controls the Courts; in one way or another, controls the Constitutional Tribunal; in one way or another, influences the CNE; in one way or another, controls Congress. Therefore, what we are fighting, in complete opposition from the whole force of the State, is to remove a dictatorship. Alfredo Pinoargote: Let’s go to next question. The dignity of the electoral processes is essential because it refers to the origin of political power. Currently, the application of the electoral rules is compatible with what the Constitution of the Republic and the international treaties of Human Rights dictates. Álvaro Noboa: We have delivered to the OAS this document, and even other candidates have submitted their complaints, in which we clearly state that not only in my case is there political persecution due to the invention of an audit that in turn results in the creation of a tax on income that is 150 times higher than that paid by Dole, but that we have also been prevented from seeking justice; they have impeded us from taking any measure of defense. They are threatening us continually. Yesterday, the IRS threatened us again during the campaign. The utilization of confiscated television channels like TC Television, Gama TV, CN3 on the part of the government. Alfredo Pinoargote: The time is up, Counselor. We move to the next one that has precisely to do with the administration and the international oversight for the restoration of justice in Ecuador. The report indicates that the Transitional Judiciary Counsel has legal acquisitions to evaluate and sanction judges, but that it has these dispositions that affect the independence of administrating justice. Would you take, in case of becoming President of the Republic, any legal initiatives so that the restructuration of the justice system would be achieved according to the mandate of independence ordered by Article 168 of the Constitution? Álvaro Noboa: Yes, and I would call a plebiscite on the reform of the Constitution with regard to it. We already have a lot of cases, like the case of Judge Posligua, who, by giving the Bananera Noboa a legal recourse was imprisoned and continues to be imprisoned. The case of other judges, for example, in the El Universo case, who were fired for finding for El Universo in such or such providence. Right now, there is no justice in Ecuador. Alfredo Pinoargote: Now, the function of the problem of restoring the administration of justice is not just that it would imply a Constitutional reform, but also a reform of the Organic Code of the Judicial Offices, in which the disposition resides. Do you think it is viable for there to be a majority in the Assembly for those anomalies to be identified? Álvaro Noboa: We have to work towards that and if there is not a majority, to recur to the people of Ecuador. Alfredo Pinoargote: Now, according to the final report for the restructuring of the justice system, social protest has been criminalized, via the application of positions regarding terrorism upheld by the Penal Code and that are being applied on the part of district attorneys and judges at the request of the Ministry of the Interior. Now the international oversight considers that this is contrary to the Constitution. Do you see the need for those dispositions to be revoked or will it simply be sufficient to apply what the Constitution says and to respect the right to resistance? Álvaro Noboa: Look, there are many laws that are good. Quite simply, nobody obeys them, the Chief of State, least of all. He himself creates them. He himself created the Montecristi Constitution with the majority of his party but he has never obeyed the Constitution. So, under my government, the laws will be followed, the Constitution will be followed, and you can be sure that in my government nobody is going to lay a hand on either the press or the courts or on any State institution that the Executive is not responsible for. Alfredo Pinoargote: Would you accept an amnesty for criminalized social activists? Álvaro Noboa: Yes, I would propose that and an amnesty for myself, because I am a politically persecuted person. Alfredo Pinoargote: A tax amnesty. Álvaro Noboa: No, an amnesty from the process of persecution. The tax process is very simple. There’s got to be a revision of the invention under IRS control. Yes, there is an invention. Tomorrow they come up with something against you or against me, that invention has to dismantled and the people, after the millions and millions of dollars that they have spent on damaging my image, they’ve got to end it in a legal manner that it was an invention of very bad faith, and all of them who participated in this invention should be punished according to the law. Alfredo Pinoargote: According to the records of UNASUR, Ecuador is the South American country that spends the most on defense in relation to its Gross Domestic Product, 2.47%, and of that sum, 64% corresponds to running costs and 16% to investment in equipment, and the salaries of the Armed Forces have improved 55% in these last years. What would your policies be in regards to the budget for investment in the Armed Forces? 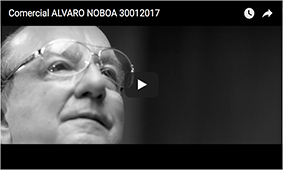 Álvaro Noboa: I think that, at the moment, we are living in a period of peace. We should have a completely specialized Armed Force, or what they call Special Forces. Many times, those Special Forces do what five ordinary functionaries can’t do and those Special Forces, in an emergency can act in a much more efficient manner, as we have seen internationally. I wouldn’t reduce the budget, but yes, I would administer it in another way. Alfredo Pinoargote: Now, the legislation of investment in equipment for the Armed Forces has brought about that even President Correa recognized publicly that the efforts that the State has made in investment has not worked. Do you believe that in order for this to work better, a military professional should once again be Minister of Defense, or should it continue to be a civilian. Álvaro Noboa: I don’t believe it matters if it is a military professional or a civilian. What is important is for there to be good communication between the Armed Forces and the Defense Minister. Alfredo Pinoargote: A professional communication. Álvaro Noboa: That’s right. You have had a spectacular diplomatic career, you could easily be a Defense Minister. Alfredo Pinoargote: Let’s go to the next issue. What is your proposal regarding fighting crime? Álvaro Noboa: Generating employment. Because when the people don’t have enough to eat, or their child is sick, they go out and steal, and that’s in respect of the person who steals out of necessity. The person who robs because he is a gangster, or a sick person, for that I am considering finding international consultants. Hopefully, Mr (Rudolph) Giuliani, who was the mayor of New York, can help us with that because he was able to clean out the mafias in New York. Alfredo Pinoargote: Regarding healthcare, the government budget destines 2.5% of the Gross Domestic Product, when, according to Mandate 22 of the Transitional Disposition of the Constitution, it should have reached 3% last year. Under your plan of government, what would the priorities be for investment in healthcare? Álvaro Noboa: The one who can best speak about this is Dr. Annabella Azín, who would be in charge of healthcare. We are going towards 3.4% and we will try to create specialized hospitals, one for the heart, the other for cancer, because many times the services are duplicated within 100km when, via the specialization the patient could move from Guayaquil to Salinas if it’s something to do with the heart. Or from Manabí to Guayaquil if it something to do with cancer. Besides which, the Medical Brigades for the countryside, for the farmers, mobile Medical Brigades. (I’ll explain that ) during a minute that I’ll have to explain preventative medicine. Alfredo Pinoargote: Let’s turn to education. In regards to education, Transitory Disposition 18 of the Constitution of the Republic orders that the State will assign, in a progressive manner, public resources from the budget for pre-school and primary level education, with annual increments until a minimum of 6% of the GDP is reached. But currently only 3.9% is destined for primary and secondary education, not including universities. What has your plan for government foreseen in regards to investment in education? Álvaro Noboa: I would expand that rubric, and we are in favor of universities not having entrance exams, that students choose their degree according to their vocation, that it be free and that there not be limited places. We are of the generation of ’69, where there were those four circumstances indicated. My studies at the state university were free, without restrictions, without an entrance exam, and I chose the degree that I wanted. Alfredo Pinoargote: Now, I was asking you about primary and secondary education. I also wanted to know about investment in primary and secondary education. Álvaro Noboa: I would also increase the number of places and I would create more technical schools, for example specialists in the products that we produce: petroleum, corn, rice, banana, soy, fruit, vegetables, flowers. All that area which is gigantic in Ecuador doesn’t have very good technical schools. Yesterday, I was in Balzar, which is a great corn-producing center of the country. There could be a big technical college for corn production, and in El Oro there should be a big technical college for banana production, better than the Zamorano University, and people could prepare themselves there for generating better results. Alfredo Pinoargote: Now, let’s go to public contracts. Over these years, Accountability has detected and proven irregularities regarding some government contracts, but after the signature and execution of the contracts when the facts have been carried out. That is part of the reform stemming from the Montecristi Constitution. Do you believe that it is necessary to return to the previous system of reporting the public contract beforehand to Accountability, or do you think that this beforehand reporting slows down the flow of State administration and the carrying out of works? Álvaro Noboa: I believe in beforehand reporting, that although it slows things down, it prevents so many corrupt acts such as have been discovered in this government. This government has broken all the records in terms of corruption. Alfredo Pinoargote: So you agree with reporting beforehand? Alfredo Pinoargote: Additionally, there are many complaints regarding diversions and the lack of discretion in regards to public contracts. The Construction Chamber even referred to contracts made on the fly under declarations of a state of emergency that now any institution can do. We are not in a State of Constitutional exception, only the President can do that in declaring a state of emergency. Do you have reforms in mind to public contracting to regulate this anomaly? Álvaro Noboa: I don’t have a study at the moment, but after this interview, I am going to see to it that they do a study into this issue. I already have a Cabinet formed in view of the surveys that we have done showing me on the increase, with Correa in first place with 35% and us in 26%. Yesterday, in District 1 in Guayas, we even got 35% Noboa, 23% Correa, and the rest of the candidates have disappeared. Alfredo Pinoargote: All the candidates say the same thing. Álvaro Noboa: They don’t say the same thing. I ask the press to join me because it is the best way to prove it. Álvaro Noboa: Could you repeat the question, please? Alfredo Pinoargote: You would propose, I would say, a popular vote in order to restore the rule of law in Ecuador? Alfredo Pinoargote: You would have the opportunity next year when there would be elections for mayors and prefects. So you could include a public consult, is my concrete suggestion. What would you propose in that consult? Álvaro Noboa: Firstly, my system of government is going to be a government that is going to be of the left in regards to social issues, and regarding economic issues, it will hold to ideas of free commerce, free trade, the lowering of taxes on income to 10%, the attraction of foreign investment, and all that one has to consult the public. We are thinking of attracting a thousand companies that pay 10%. The Treasury will have ten thousand, and at the moment there are 40 groups and none of them are large, that pay 23%. That is to say, its 800 or 900 which the Treasury is getting, which is less than what I am proposing. With those 10,000 the $50 voucher that I propose is do-able. Alfredo Pinoargote: You have one minute now to formulate a message to citizens. Álvaro Noboa: The hardest hit people in the last six years have been the farmers and the unemployed. The number of people who receive the Voucher has risen from one million to two million. That means that unemployment has doubled in Ecuador and the farmers have spent six years losing money and many of they owe so much to the National Development Bank that in those cases one would have to extend them an amnesty from that debt because it is greater in value than the farms that they have. Farmers have to earn money, and to do so, the prices of farming supplies have to come down, and the commercialization, in regards to agriculture, has to be fairer. In order for Ecuador to return to where it was, Correa has to go; in order for unemployment to end, Correa has to go and Álvaro Noboa has to come in as President of the Republic. Alfredo Pinoargote: Our time is finished. Álvaro Noboa, PRIAN candidate for President of the Republic. Thank you for your participation in Contacto Directo.